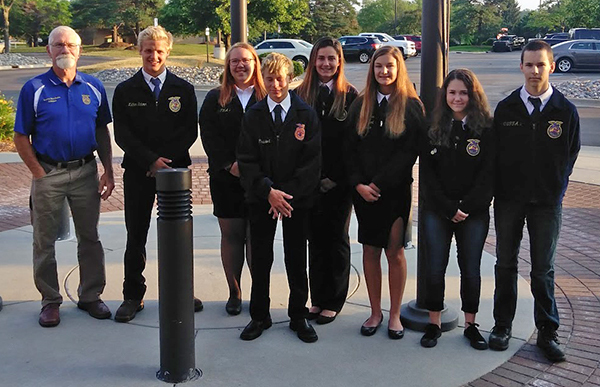 Tag Archive | "State Leadership Conference for Chapter Officers"
Summer has gone especially fast for the Cedar Springs FFA this summer. 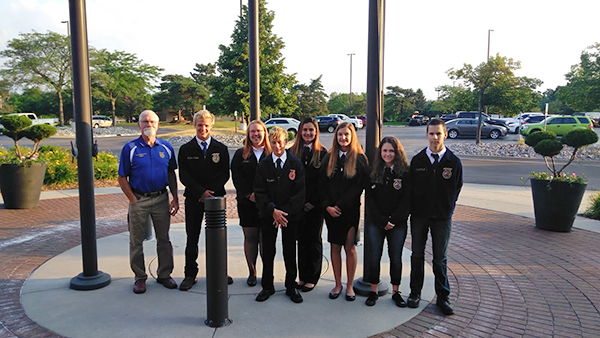 It all began when the High school FFA officer team had the chance to attend the State Leadership Conference for Chapter Officers (SLCCO) in Lansing on July 9 and 10. The eight members of the officer team attending include Dylan McConnon, Olivia Martinek, Chloe Boomgaard, Carly Dunham, Angel Shears, Trevor Marsman, Jared Smith,and Mr.Reyburn. These students had the opportunity while at the conference to attend three different sessions that were themed with different points of leadership: how to set goals, how to work as a team to achieve goals, and communication skills that will help the officers step up to the plate and become the best leaders possible. Just days after returning from SLCCO, a group of FFA members returned to the MSU campus. The group included Alyssa Marshall, Dylan McConnon, Alyssa Roelofs, Axel Anderson and Trevor Marsman, and coaches Brent Willett and Cade Hall. They had the chance to participate in a Livestock Judging competition on July 12. They spent many countless hours practicing and going to fairs to practice judging livestock being shown by other people. The team put all they had into the competition and placed 11 out of 27 different teams. Great job team! The land lab work began with Wayne and Trevor Marsman planting the corn in the field by the high school and Dylan McConnon spreading the fertilizer on the field. Dave Dunaven and Steve Smitz helped the FFA by tilling and planting the soybeans and making sure that everything was set in order to have a great crop this season. Jerad Smith and Dylan McConnon applied herbicides to both of the fields. Along with this great group of people we had Jake Gebhardt, who helped both groups of people to prepare the field for planting. Dylan McConnon and Tyler Schoen represented the FFA and Cedar Springs well in the state tractor driving contest. 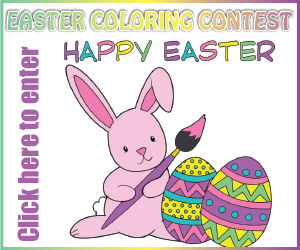 Dylan finished in first place,and Tyler followed behind in fifth place. Many of the chapters members participated in the showing of live stock at the Kent County Youth Fair while other officers worked a booth selling meat sticks, maple syrup, and work gloves along with running the Agricultural Adventure barn to help younger kids learn about the many areas of agriculture. The barn was not only run by the Cedar Springs chapter but the Lowell and Caledonia chapters as well. All student entering the High school and returning high schoolers keep a lookout for the FFA at orientation with some games for everyone to enjoy.